I’ve been asked many times to recommend books on wildflower identification, usually “with lots of photos”. 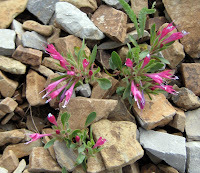 But good comprehensive useable wildflower guides for the layperson are uncommon; in fact, there may not be any. Even the best by necessity include only a subset of the flora; there always is the chance of finding something that isn’t in the book. The diversity of the plant world is the issue. While there are 800+ birds in the Golden Field Guide Birds of North America (north of Mexico), there are about 2600 plants in Wyoming alone, on the order of 6000 in California and 20,000+ in North America north of Mexico. Compounding the problem, characters for differentiating plant species tend to be small, or subtle to the human eye. While photos may seem the best means of identification, often it is difficult to capture key features and range of variation with photographs. There’s no getting around it -- plants can be tough to tell apart. 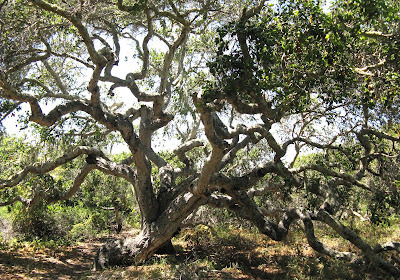 (Quercus agrifolia, the coast live oak). The Audubon Society’s Field Guide to North American Trees, Western Region (300 species, including common naturalized ones), takes an approach that is a bit more involved, but probably more successful in the end if one is willing to invest the effort (isn't that always the case though?). In the first part of the book, trees are grouped by leaf shape, or flower color, or fruit type. Photos are provided for each species to help with choice. One then looks up the chosen species in the second part of the book, where there are descriptions, line drawings and distribution maps. In the introductory section there are helpful drawings and definitions of important plant terms; becoming familier with these is a worthwhile time investment if one wants to get to know trees. Then there are dichotomous keys. The name alone is off-putting, and these keys can be overwhelming to a novice or layperson due to the unfamiliar botanical terminology. Dichotomous keys are used extensively in professional manuals, though some online resources now offer more promising and intuitive approaches (see IdentifyLife for examples). A dichotomous key leads the user through a series of choices, each with two alternatives. Each step eliminates a group of plant species, finally arriving at the correct determination (usually). 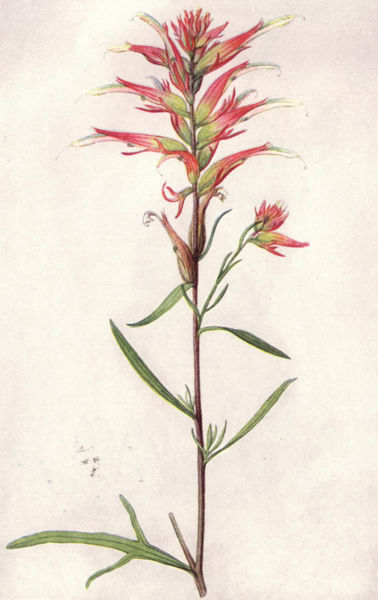 Final steps in keying out the State Flower of Wyoming, the Indian Paintbrush. From Dorn 2001. But a dichotomous key can be a very useful tool, and does not have to be difficult. 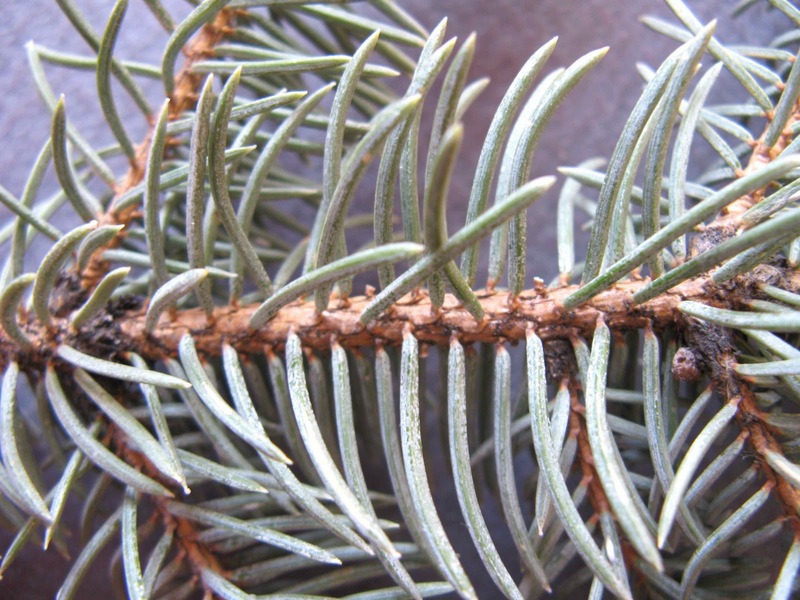 Identifying plants with dichotomous keys is much easier to understand if one actually does it ... so let’s have some fun and identify a tree! In North America, we're fortunate to have a relatively-simple tree flora (vs. the tropics ... oh my!) 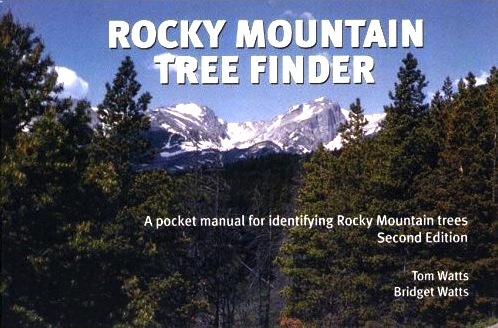 as well as a neat series of guides to tree identification -- the Tree Finders, for example the Rocky Mountain Tree Finder (RMTF). These little books are easy-to-use dichotomous keys. 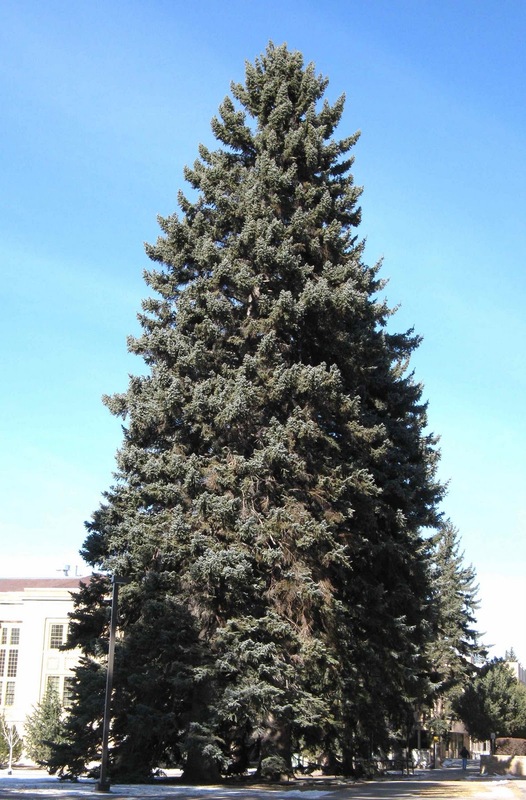 When I taught field botany at the University of Wyoming, the first day of class each summer included a field trip on campus identifying trees with our RMTFs. I’ve used Tree Finders with kids too young to read the choices themselves. They are a good introduction to dichotomous keys, they work well in many situations (but see NOTE at end of post) and they’re fun. As a demonstration, let's identify the tree on the right. So what’s the answer? (check branch on left). Did you say "needles or scales"? That's correct, our tree does not have "ordinary leaves". Very good! Having chosen the first alternative, we now go to the Christmas-tree symbol at the bottom of the page. 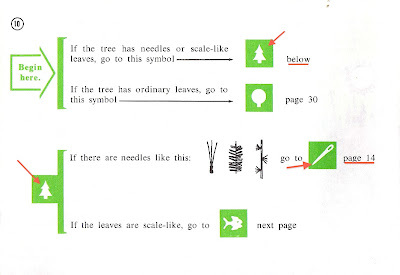 Here we have to decide if there are needles OR if the leaves are scale-like. 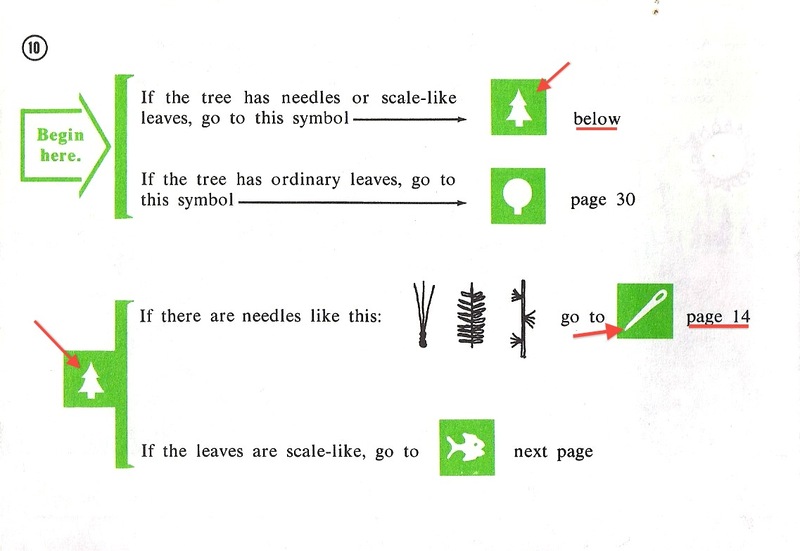 Because our tree has needles (I hope you agree with my decision), we go to page 14 where at the bottom we see the needle symbol. 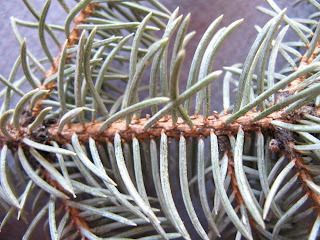 Here we have to decide whether the needles are bundled OR single (needles are single, see close-up below). Answer: Ours are easy to twirl, I tried it. 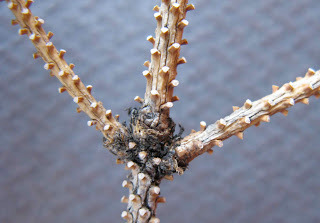 Answer: Ours are the former, see bumps on twig below. 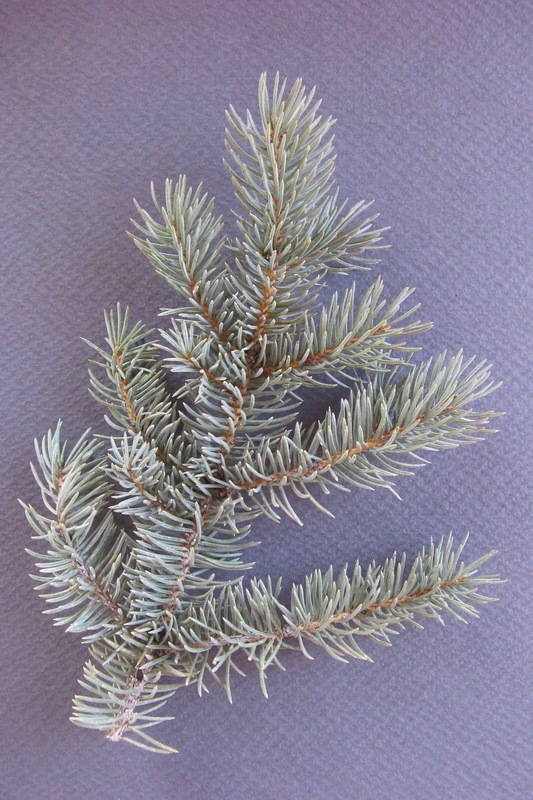 ... it’s a SPRUCE! but what kind? 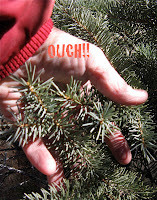 Answer: These needles clearly are sharp-pointed! 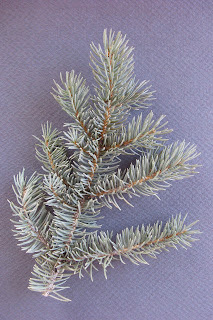 ... it’s a COLORADO BLUE SPRUCE (Picea pungens) and we’re done! 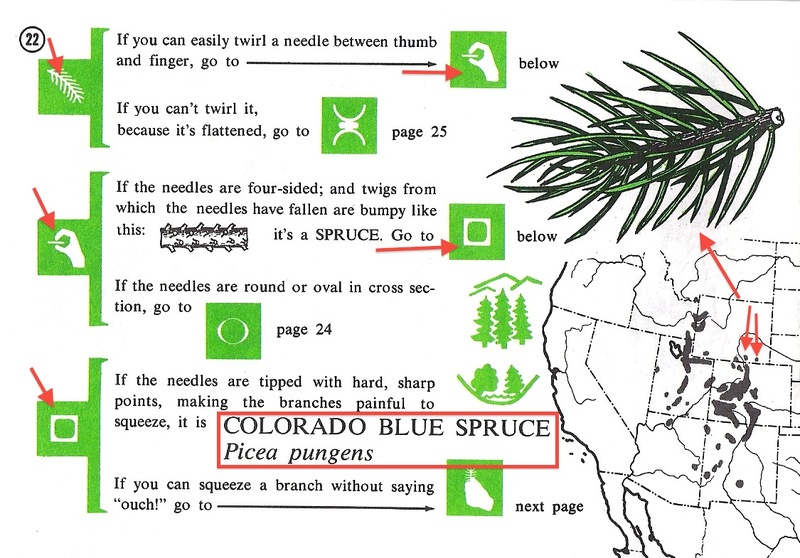 The final page for our tree has a drawing and map, which we use to confirm that our determination is correct -- yep, looks right and its range includes the mountains of southeast Wyoming. 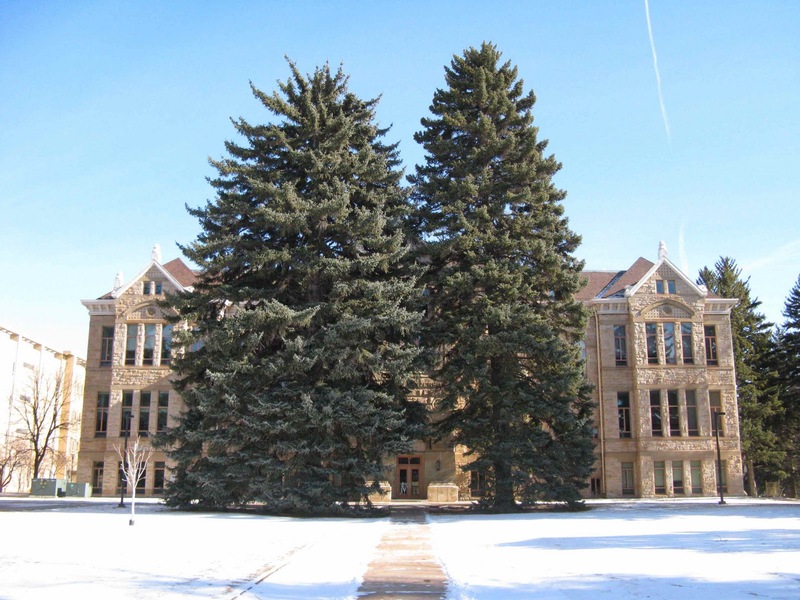 There also are life zones symbols -- the Colorado blue spruce grows in the montane and subalpine zones, as well as on the University of Wyoming campus. Colorado blue spruce in front of Old Main, University of Wyoming, 2012. Old Main was the first building of the University; photo ca 1908. The Rocky Mountain Tree Finder is just one of a series of tree finders. 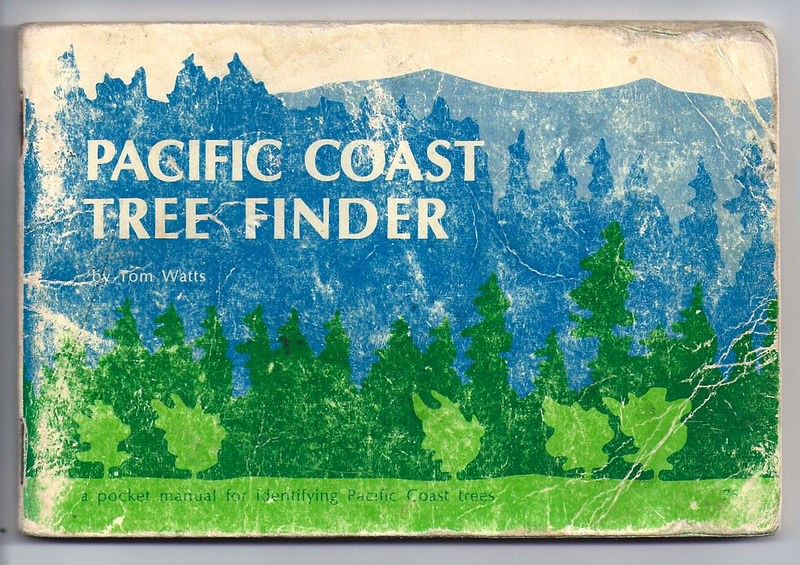 The Pacific Coast Tree Finder was my introduction to dichotomous keys. I bought one several years before my first botany class, and was quite happy with it. 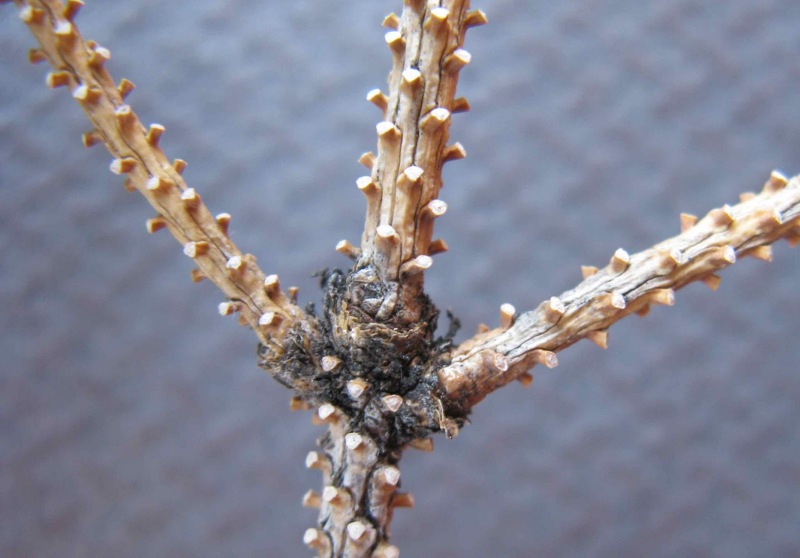 There are many “finders” by the Nature Study Guild, including guides to winter trees, desert trees, birds, tracks, ferns, intertidal life, constellations and several for flowers of various regions. I’m skeptical about the last for reasons discussed in the beginning of the post, but I haven’t given them a try so can’t say for sure. There’s little financial risk in testing a Finder as they are cheap -- generally $4.95 each. To see the complete offering, visit Nature Study Guild Publishers. 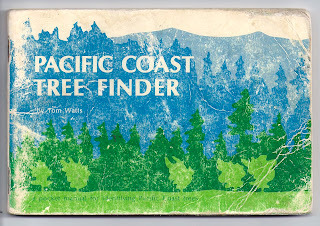 The Pacific Coast Tree Finder, a real bargain at 75¢ (1973). 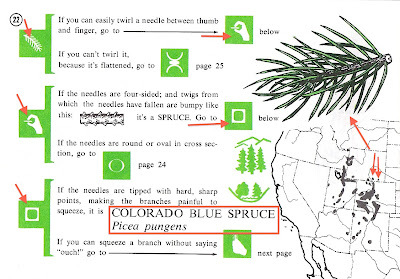 That's really interesting... do you know of a good book specifically for California trees? Or the North America book would cover enough of it already? 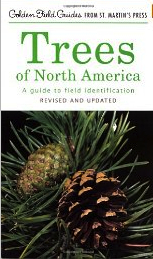 The Audubon Society's to Field Guide to North American Trees, Western Region would be a good choice. 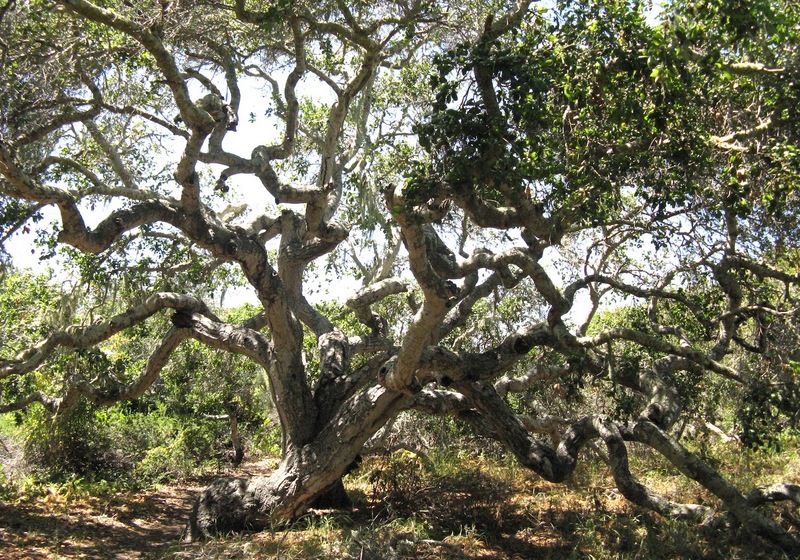 I'm not familiar with anything specific to California, aside from the Pacific Coast Tree Finder -- which will help you identify trees of the coastal region, but doesn't provide nearly as much information as the Audubon guide. If you find something good, let me know! 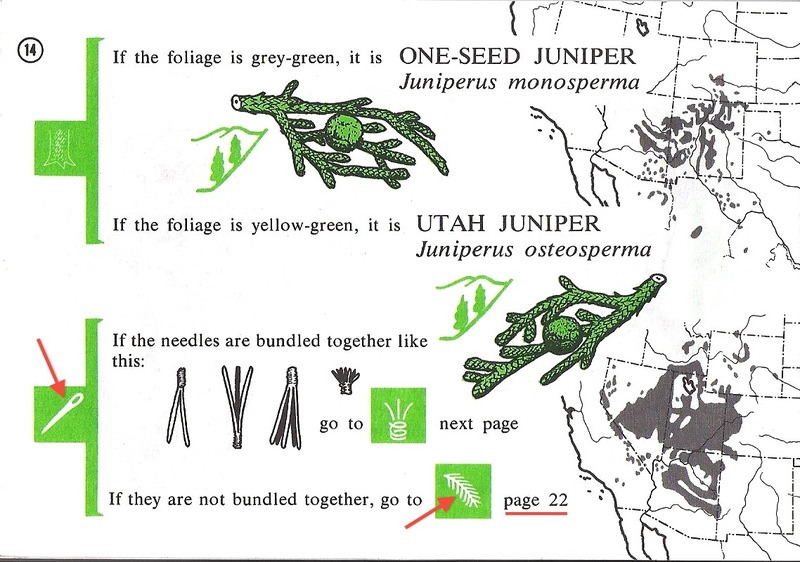 I like to get "wildflower" books specific for areas, like this one for Nevada, and then look up more details at the USDA plant website (http://plants.usda.gov/java/) once I've taken a picture or two. I have a tree book for the Sierra Nevada that has common associations in the back, which I've found helpful, it might be "Sierra Nevada Tree Identifier" by Paruk and Morales. I do end up with many plant/flower, cactus, and tree books! yes, "regional" is key. With so many species, and regional differences in floras, if you can find something specific to an area that is THE best way to go, eliminate all those irrelevant species! So it's worth it to have all those plant books :) I have the NV one you mention, and like it though I haven't put it to a good test ... yet. If you ever get over here (NV) to make a test, let me know. Maybe we could meet up!